1. Prior to the new changes, the Bill would create a “shall issue exemption” to the concealed pistol free zones listed in MCL 28.425o for anyone who takes an additional 8 hours of training, or who is a certified instructor. 2. The changes would ban the open carry of firearms in ALL gun free zones listed in MCL 28.425o without being a property owner, private security or WRITTEN permission. Penalties start at a $500 fine and go up to a FELONY. Aaaand it goes further by adding all property owned/controlled by Airport Authority to the list as well. Gun Covered by 3mm Fabric = OK. Starting to smell what we’re stepping in? In short, we continuously see those elected as “representatives of the people” who have a duty to serve the whole of the people, while not trampling on the rights of any individual. When we see proposed or actual legislation that slaps in the face of facts, places fees on the exercising of rights, reduces or removes the rights of any citizen the ability to defend house, home, self, or any innocent life, we must ask ourselves what drives that train? Gross ignorance or willful intent? Regardless of the answer, those who would do so are not fit for office and in violation of their charge. Stop penalizing the whole for actions of the few and instead give the people BACK the tools needed to stop evil wherever it may be. …Im half a pot of coffee in so that’s what I have now but damn its a start. Responsibility with zero tolerance for those who are a liability. And of course, call/email/text/carrier pigeon/smoke signal (of course only if you paid the fee and with proper burn permit) you reps to make your voice heard. 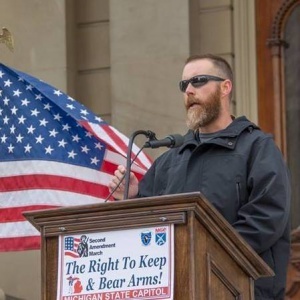 (Here is the official Arlan Meekhof on Bookface if you have any follow-up questions) Get out and support groups that have their ears to the ground working to protect our 2A rights like Michigan Open Carry, Inc and Michigan Gun Owners. Get involved now or work on your, “Remember that time when we could….” stories. Be responsible and rock on.